Brown butter seems to be all the rage these days — for good reason. Cooking butter in a pan so that the milk solids turn a golden brown gives butter a deep and nutty flavour. Brown butter is great over vegetables and adds a unique flavour to baking. We love putting it in this deceptively simple loaf cake. Now… if you haven’t browned butter before, it may take a while to get the hang of it. The trick is to keep a close eye on it as the solids can burn easily and burnt butter is not tasty. You’ll know it’s ready when a bubbly foam forms at the top of the pan and the brown solids separate at the bottom. If you get a lot of foam it can be hard to see, but if you tilt the pan and see that the solids and the buttery liquid on top of them are amber, take it off the heat. This cake is also flavoured with a little bit of liqueur — because the rest of the cake is fairly neutral in flavour, you can choose whatever you have in your cupboard: Amaretto, Grand Marnier, or flavoured rum. We chose to use a coffee flavoured rum and it worked out beautifully. 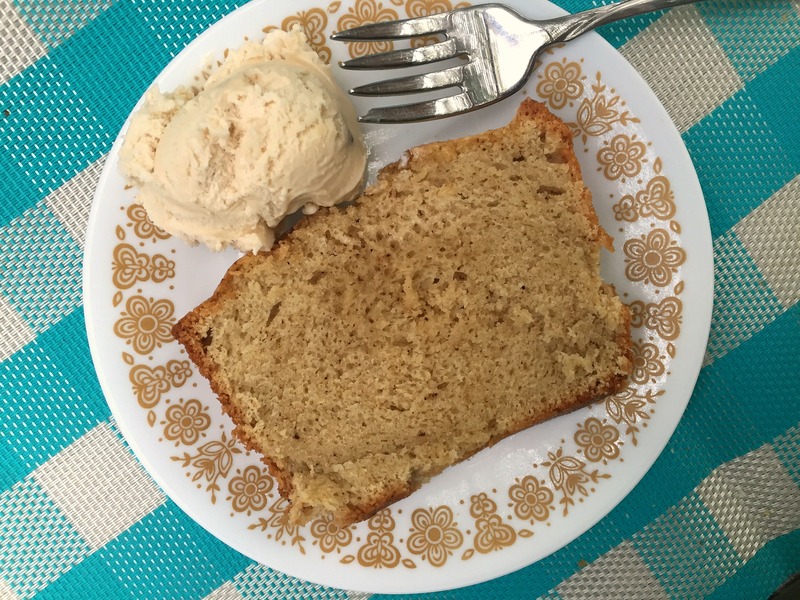 Serve this buttery loaf with coffee or with a scoop of ice cream for dessert. Place the butter in a small saucepan over medium heat. Let the butter melt, stirring occasionally. Once melted the butter will come to a boil, let it simmer until a foamy layer forms on top, the liquid butter is amber in colour and the butter solids at the bottom of the pan are a golden brown (don’t let them burn). This should take about 5 to 10 minutes. Remove from heat and let cool slightly. Preheat your oven to 350 degrees F and spray a standard loaf pan with non-stick cooking spray (you can grease it with butter instead if you prefer). Place the sugar in a large bowl or in the bowl of a stand mixer. Using the stand mixer or hand-held beaters, mix the sugar with the eggs until fully combined. Mix in the vanilla, the whipping cream and the liqueur or coffee. In a medium bowl, whisk together the flour, baking powder and salt. Slowly add the flour mixture to the sugar and egg mixture, mixing until just combined. Pour the browned butter into the batter, gently folding it in as you pour. It may look a little oily, but it will all work its way in as the cake bakes. Scrape the batter into the prepared pan. Bake for an hour or until the top of the cake is browned and a toothpick inserted in the centre of the cake comes out clean. It’s complicating, but it’s worth it. I cooked it yesterday, was delicious. All my friends were surprised how tasty it was. Will put this recipe into my bookmarks.